Water: This species is found in mountain streams where the temperature ranges from 15-25°C/60-77°F. The pH varies from 6.8-7.8 with hardness ranging from GH 5-25°, making it very adaptable in the home aquarium. Diet: Puntius Denisonii accepts most foods, including flakes, granules, small pellets, spirolina, hair algea, as well as frozen foods. Bloodworms, cyclops and daphnia are readily taken and can help heighten the red colouration in the fins and on the flanks. Feeding a color food rich in astaxanthin and other carotenoid pigments as the sole dried food can also help make this species more colorful. 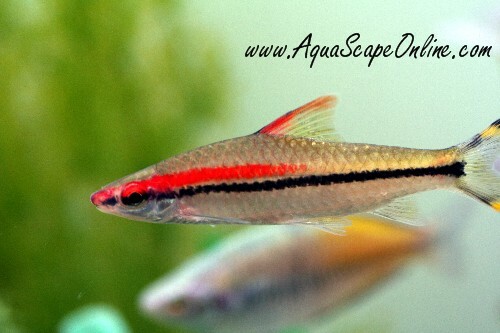 Aquarium: A high oxygen level is a must for this species since they are found in fast flowing waters in India, particularly if the water temperature is on the high side. 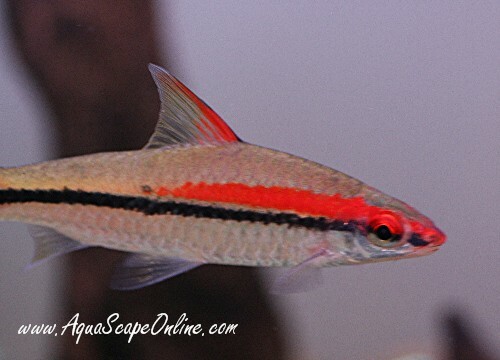 It's peaceful and non-territorial and can be mixed with tropical community fish. 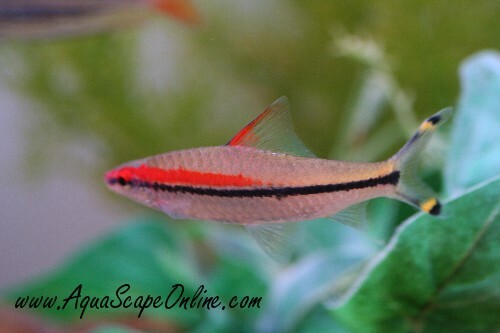 Puntius Denisonii are best kept in groups of 4 or more to really appreciate there beauty, although single specimens will do great in the aquarium as well. Make sure the aquarium is covered as Puntius Denisonii can be jumpers.